Before we get married and before we moved in together, my husband thought I didn’t know how to cook, or as he says in his own words: “ I thought you weren’t that great of a cook”. Nobody told him so, I guess, there was no sign on my forehead saying: “Kitchen Hazard” and I don’t remember him even asking me if I knew how to cook or if I love cooking. Was it my look? My hands? My age? The way I eat, or may be the way I tilt my head back when I laugh? No! Nothing. He just figured I didn’t cook. The first dish we had together coming home, after an eight hours flight and jet lagged was an onion and Gruyere omelet. I overcooked the omelet and it wasn’t as moist as I like it but he was stunned, charmed. In other words my omelet proved him wrong: I knew how to cook, sort of. Since then, my skills in making omelets have improved and he had, hopefully, noticed how lucky he is to have such a talented, not to mention smart and beautiful woman. He knows by now that as much as I love taking on new challenges and never made before recipes, there are those days when I am much happy with a simple salad, some mashed potatoes or a savory tart. I saw this tart some weeks ago, and it was one of those recipes that I had to make. You know the feeling, right? You see a photograph that catches your attention. You start to read the recipe and get mesmerized by the combination of the ingredients and how they sound wonderful together. You start dreaming about it day and night and anticipating the flavors in your mouth until you have all the ingredients and decide to make it. I was in love before even making it. I thought it must be like having a slice of Brie on a slice of bread in one hand and a fresh fig in the other, and popping the whole thing together in your mouth. It must be even better on a tart. The first night, I served it hot since you can either serve it hot or cold according to the recipe. How do I say this delicately? I didn’t like it hot. I ate it because I was hungry. The figs were still bubbly hot and I couldn’t taste the cheese. You could have used any other cheese instead and I wouldn’t taste it anyway. That’s how strong the flavor of hot figs was. But the crust was delicious. The second night, still wanting to give it another chance, I served it at room temperature. Reheated just a little bit and let it cooled before serving it. My husband said he liked it better this way. It’s true that the figs being cold, you can have a taste of all the ingredients together but the cheese, even being perfectly ripe, wasn’t as melting as I expected it to be. In fact baking it kind of spoiled it, and I know now that I prefer to have my Brie on a slice of bread. This tart was not what I thought it would be like, not what I had imagined and looked forward to. Nobody promised me it was going to be an explosion of flavors in my mouth and that I will instantly love it. Was it the tempting picture? My weakness for figs, or my lack of judgment? I don’t know. I just figured it has to be delicious. I guess appearances can be deceptive after all. 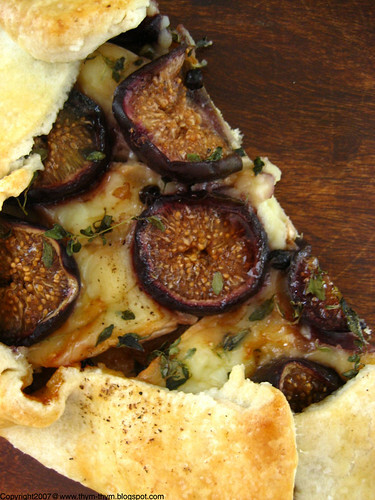 I have been fantasizing about a fig tart for ages!! The one you baked looks so good..I wonder why you weren't happy with the results.. Do you think it might be the choice of cheese? How about blue cheese instead of brie? Do you think that would have worked better? When I read through the recipe I too thought that brie sounded really good for the tart, I think it is just one of those recipes that looks better then it is. I love Brie too so I was sorry to hear that it did not shine through. Sorry it didn't come out like you wanted, but it looks absolutely amazing to me. - Mingoumango, bienvenue au club! mais c'est vrai que c'est le seul moyen de savoir a quoi ca ressemble"vraiment" sans les projecteurs. - Claude, je dis heureusement parce que c'est ainsi qu'on apprends de ses erreurs.Et puis y'a pas de honte a dire que des fois ca ne marche pas comme on le souhaite...Nul n'est parfait. - Hi Shayne! I too love Brie especially when it's perfectly ripe. I guess figs where too strong for this type of cheese to put on a tart. But I had Brie on a slice of bread with figs and it's heaven. - Cheryl, thank you very much, if only the taste matched the beauty of the tart. I guess it was the choice of cheese that was too mild for the figs. What a nice surprise for your husband that you could indeed cook! 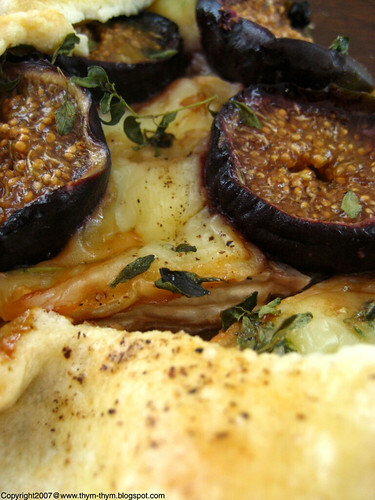 I think the combination of Brie, honey, thyme, figs and onion slivers sounds awesome! And, it looks great! But sometimes, even though it sounds great, it just does not work. Now the adventure is to make it work with a few new ingredients! - Aimee, now that he knows that I can cook, he thinks there is no need to go to restaurants since he prefers my cooking..."blush".But I love trying new restaurants! - Deb, it does, you're right. But I think it was the choice of cheese that couldn't stand up to the figs. But it is worth making it in a different way. Yes Rose I understand you, and the pictures are so beutiful, my first impression is so nice !!! it will be wonderful and is not, but if you dont make never you will know how was.It's the life I think. I thinkful you for this. I'm sorry to hear you didn't like the tart - but I have to say your photos make me think it is amazingly delicious! - Gloria, The pictures of the original recipes were beautiful too. That's why I decided to make it. But like you said, if I didn't make it I would never know if it was good or no. Thank you very much my dear Gloria for your kind words. - Patricia, You may laugh at me but the more I see the pictures the more I think: "Hmmm, may be that wasn't that bad. I might try it again..."
Even if it didn't fulfill your expectations, the tart looks so delicious! I, too, could be tricked into making this with such a wonderful picture! - Eva, now I've learned that pictures aren't a guarantee of anykind. But thank you very much for your kind words. Glad you enjoyed the pictures. I can't believe he didn't know what an amazing cook you are! That omelette must have made him feel like the luckiest man in the world. Such a nice story. Beautiful photos - what a bummer the flavor wasn't quite right. I'll bet you can tweak it into something really special though.